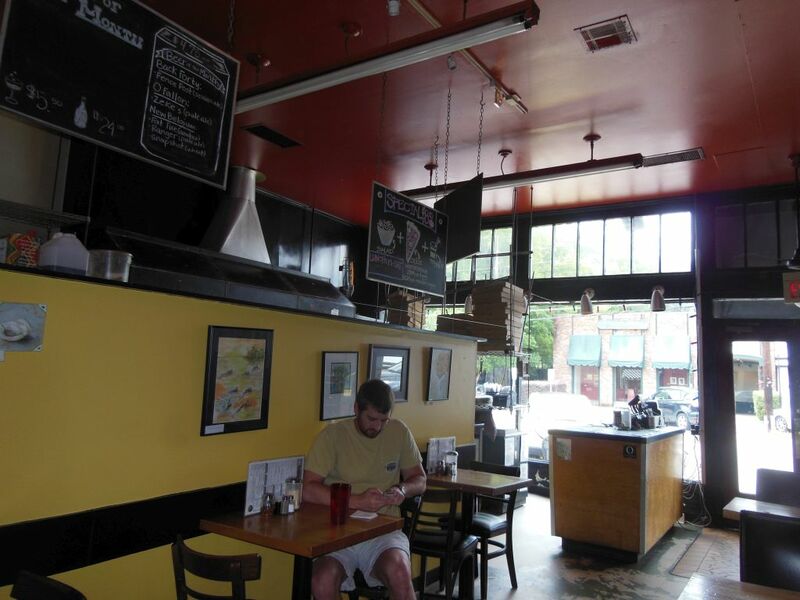 There are quite a few pizza joints that I visited before I became the self-anointed Pizza Snob. Recently I returned to one that I enjoyed despite it not being a purveyor of classic New York-style pizza. On our way to the Florida Panhandle for our annual beach vacation, Mrs. Pie and I took a break in our drive for a late Saturday afternoon lunch at Tomatinos Pizza & Bake Shop. Retracing our steps from a few years ago, we exited the Interstate and ventured about 2 miles east into the vintage Old Cloverdale neighborhood. 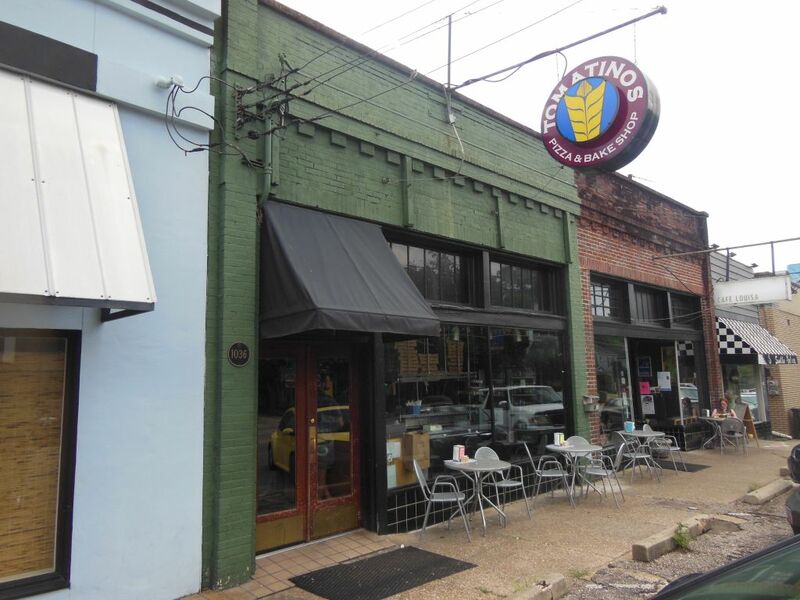 Down a lane of willow trees adorned with Spanish moss, this funky old joint sits in a row of storefronts across the street from an old independent movie theater. As their name might imply, Tomatinos pizza focus is more from the aspect of a bakery than an Italian restaurant. (In other words, it seems more crust-driven.) Around since 1995, they boast of their local fresh healthy fare serving up both traditional and whole wheat crusts. Their menu includes salads, calzone, and a focaccia sandwich. Beer and wine are also served. These same folks operate the adjoining Cafe Louisa where you can find baked goods, small lunch items and gelato. 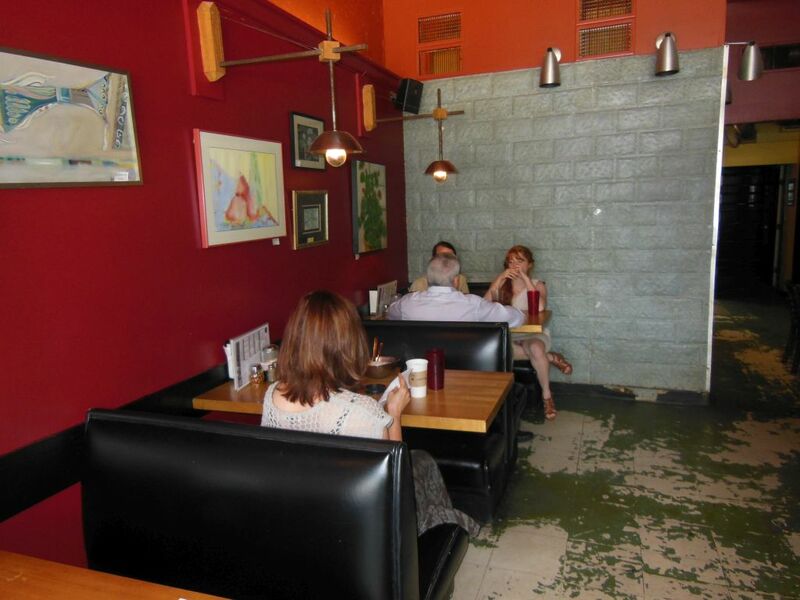 Tomatino’s operates a small room with just a few tables and booths. (There is limited outdoor seating which we passed over in the 90 degree heat.) They sell slices at lunch time, but upon our late arrival we found just two lone slices left: plain cheese on a whole wheat crust. Rather than waiting for a fresh whole pie with traditional crust, I decided that I would have my first ever taste of whole wheat crust. My slices did not take long to reheat and came out served on a small silver tray alongside an apparently unnecessary knife and fork. 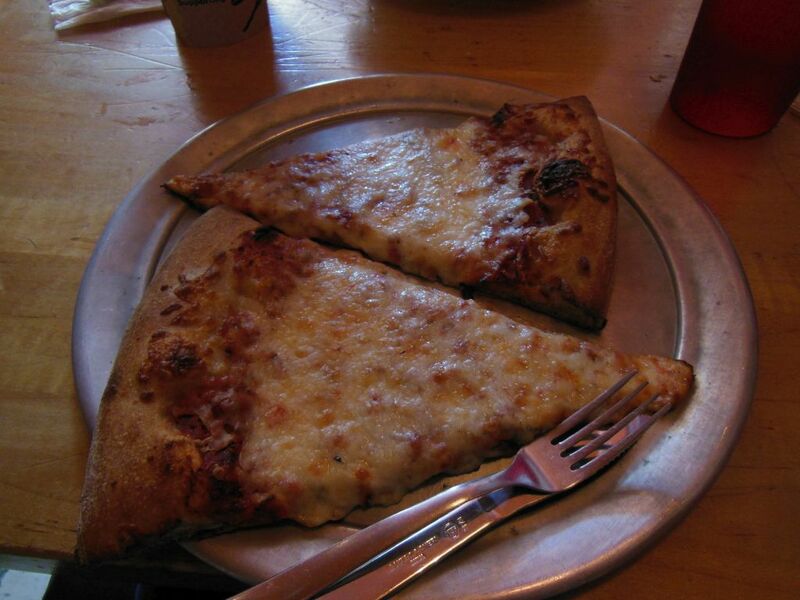 Although these babies were not classic NY slices (about twice as thick as they needed to be) they were toasted crisp. They looked rock solid firm and ready to hold although too thick to fold. However, I got quite a surprise when my first bite broke the slice in half! Mrs. Pie theorized that this was likely from a whole wheat slice having less gluten to hold things together. Despite this lack of cohesiveness, the pizza was toasted brilliantly, and the crust had a nice crunchy chewy taste. I was quite overjoyed with the bright refreshing taste of the whole wheat. It really brought the slices to life making the crust sparkle with flavor. The 100% part skim mozzarella was also way delicious, and the tomato sauce was and rich tangy. Tomatino’s treat was about as tasty as a non-classic slice of pizza could be. For the record, my second slice did not fall apart. Tomatinos is well-worthy of another visit—if not just for the pizza but for the fabulous salads and yummy addictive gelato. If there is a next time I will probably give their traditional crust a try. Likewise, I am now looking forward to trying someone else’s whole wheat crust to see how it compares—the Snob may have entered a new realm.